If you have just had your ear pierced, or you pierced your baby’s ears, you may need to have an eye on the risk of infection. No matter the position of the piercing on the ear, there is always the risk of infection if the right care is not given. What is an infected ear piercing? After piercing your ear, you expect to have the puncture in your ear to have healed in a few days. While many people heal without issues, it is never the case for others. Without proper hygiene on your end and the piercer’s, the chances of having an infection are always present. When the piercing in your air is infected, you will notice a difference in the healing process, the amount of pain and other such symptoms of an infection. By infection it means that microorganisms have invaded the open wound and started growing and spreading from it. Most often, the infection is caused by bacterial infestation. If the area around the piercing becomes more tender than it usually is coupled with some more symptoms such as pain or redness, it is highly likely that you have an infection. Rarely does tenderness mean any good as far as piercings on the body go. Bumps can also be signs of an infection especially when they turn red in color. Other times, bumps can simply be signs of irritation and nothing to worry about. You will need to find a way to soothe the irritation to do away with the issue. Redness, inflammation and ear bumps are a sign of disease. When the color of the pierced area changes in any way, it is often due to an infection. A red coloration with some pain with or without a discharge is always a reason for alarm. You may have also noticed thread-like lines that are inflamed around the pierced area. These inflamed streaks are always signs of an infection progressing. Most infections have fever as a symptom especially in its advanced stages. By the time you have a fever from an infection, it means it has progressed and could be the cause of other serious problems if not treated early enough. The advantage with most infections is that you are likely to notice the on-site symptoms such as swelling, discharges and others before the infection is strong enough to cause a fever. You should, of course, expect some light bleeding after the piercing is made. This bleeding should stop almost immediately. If it continues, it points to an issue either with having an infection, poorly positioning the jewelry, or having injured yourself. Immediately after the piercing has been made on the cartilage or lobe of the ear, you should expect some slight swelling. This kind of swelling should go away at least after the third day. If by the third day you still have the same swelling, or it has increased in size, you need to have it checked. When the swelling spreads to the jaw and the neck and causes pain in these regions, be sure that the piercing is infected and needs the attention of the doctor. If you see the swelling and a discharge with a yellow, green, grey or brown discharge with a foul smell, it is clear that you have an infection. However, if the swelling is slight and the discharge is colorless, you have nothing to worry about since it is normal. Make sure the equipment used to pierce your ears are sterilized to avoid infections. Besides infections from dirt, unsterilized equipment can pass on diseases from one customer to the next. When you use the wrong type of jewelry for your ears, you will make it easy for microorganisms to make an entry into the body. First of all, the jewelry may irritate the piercing leading to itching. As you itch the area, you will tear the skin thus paving way for the entry of germs. Some materials, such as nickel, are not recommended for use as they are of a poor quality and irritate the skin. As the body releases antigens to fight the irritation, you will have inflammation then the formation of pus. Keep off cheap jewelry and those that are too heavy or tight as they are no good for you. If you take a swim in water that is contaminated and the piercing is yet to heal, you will likely infect it with the germs from the water. Too much chlorine from some pools will also irritate the piercing. As you scratch the ear, you will tear the skin and open up pathways for the germs to enter. Touching the piercing will only make it easy for the germs to move from your hands to the piercing. The same is true if you use jewelry that is not clean. Until the piercing has fully healed, avoid touching it unnecessarily. Even when the piercing healed successfully, you may still have infections especially with too much touching, changing the jewelry, injuring the ear, and many other causes. As long as you have chosen to have your ear pierced, you need to take good care of it. Almost every part of the outer ear can be pierced for the insertion of jewelry. That means that all the parts of the ear can get infected if there is any lapse on the hygiene side after the piercing has been made. The most common part of the ear infected is the earlobe. The reason for this is that a large number of ear piercings are made on the earlobe. The good news is that infections on the earlobe clear out faster than other parts of the due to less rigidity and being supplied with more blood vessels than, for example, the cartilage. The rest of the ear is more or less made up of cartilage which too can be pierced and thus likely to be infected. Cartilage will on average take longer than an infected earlobe to heal. Most people are nowadays piercing the ears of their babies while they are at a tender age. There is a positive and negative side to the issue at hand. The advantage for most is that it will be done early enough such that the child will not have to deal with piercing at an older age. The disadvantage is that the chances of infections on ears are higher than in adults. The fact the immune systems of the babies are still developing and the high likelihood of the baby pulling on the piercing and generally touching it increase the likelihood of having an infection in the ears of your kid. Infections in kids can be quite dangerous as they can lead to further issues such as keloids, allergic reactions, irritation and others. You thus need to consult the doctor once you notice any signs of infection in your baby. Besides that, regular cleaning of the piercing will keep away infections from the wound in your baby. 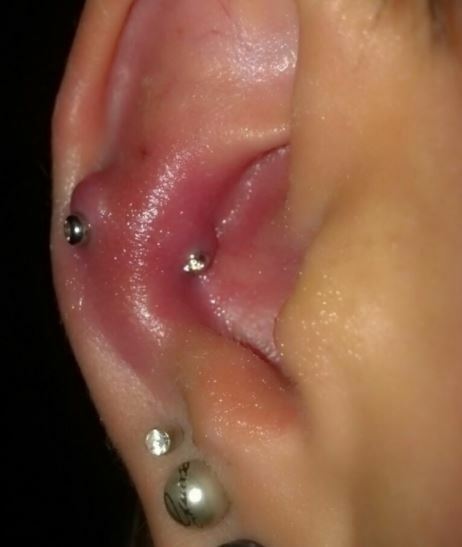 Keep irritation away as much as possible to keep the baby from touching the piercing. No matter the type of piercing you would have made on the ear (or other part of the body), you will need to treat the infection once it sets in. There are two groups of treatment methods namely medication and home remedies. Painkillers such as ibuprofen, aspirin and acetaminophen and others are used in relieving pain caused by the infection. You need to know that painkillers do not heal the infection in any way. They simply mask the pain caused by the infection and do nothing to stop the infection. For minor infections, you will be able to use over the counter medicines available in the local pharmacies. These do not require to be prescribed since they are mild and most of them have a standard dosage. Most creams, ointments and oral drugs fall under this category. However, even with their mild nature, these drugs should never be taken without the direction of a medical practitioner. At least the instructions of the pharmacist will be sufficient. There are the stronger and more complex drugs which are meant to treat advanced iterations of the infections and their symptoms like discharges, swellings, fever and others. For these drugs, the prescriptions of the doctor must be adhered to and under circumstances can that be skipped. If the signs of the infection are still mild and the issue can be easily dealt with, you can start using home remedies to heal the infection. You need to know that the effectiveness of home remedies in treating the infections is varied. The use of alcohol on wounds speeds up the healing process and fights off germs that may cause infections. Rubbing alcohol should be used as a cotton swab to clean the piercing at least twice a day to keep off germs. With its antiseptic properties, tea tree oil is used in fighting harmful microorganisms like germs. It can be used in various ways including directly applying it to the piercing. A compress is made by soaking a piece of cloth in a liquid, rinsing out the excess liquid then using it to press against a given area of the body. As their names suggest, cold and warm compresses are made by soaking a piece of cloth in cold or warm water respectively then pressing it on the affected area. A warm compress is recommended on aching piercings that may have some slight swelling. A cold compress, on the other hand, is great for mild pain. For bleeding wounds, avoid using a cold compress. A sea salt solution is one of the most recommended items to use after you have had a piercing. It fights off most germs to keep the ear clean and disinfected without the need for expensive disinfectants. You can make your own solution by mixing ¼ of a teaspoon of non-iodized sea salt in a glass of warm water. You can soak the infected part of the ear in the mixture at least twice a day. If the work of making your own sea salt solution is too much, buy a solution called H2Ocean which is a solution of non-iodized seas salt used for keeping wounds and piercings clean. With jewelry, always go for the best quality you can find since poor quality jewelry tends to irritate the skin leading to itching which will in turn make it easy for germs to enter the body. You should also avoid touching and frequently changing the jewelry especially when the wound has not yet healed. Keep to anti-bacterial solutions and soaps, alcohol and sea salt solutions for cleaning the wound. No matter the age of the piercing, you should make sure you clean it on a daily basis to keep off germs and irritations. After cleaning your hands, use either a sea salt solution, an antibiotic solution, or alcohol to clean the piercing as frequently as possible. 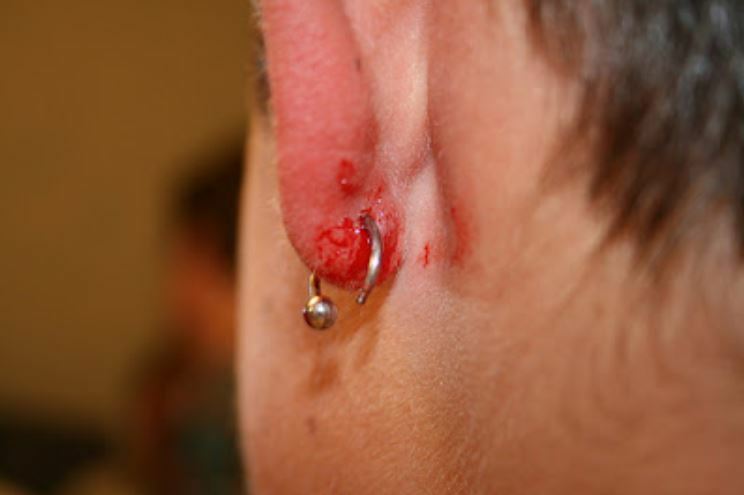 As you clean, avoid disturbing the studs or jewelry in the piercings.